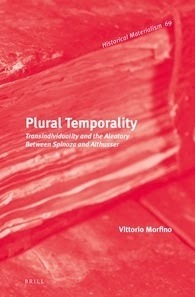 Home Lifestyle Nog een op komst: "Plural Temporality"
Nog een op komst: "Plural Temporality"
De uitgever schrijft: "Plural Temporality traces out a dynamic historical relationship between the texts of Spinoza and of Althusser. It interrogates Spinoza’s text through Althusser and vice versa, with the intention of opening new horizons for the question of materialism. From the fragmentary intuitions Althusser produced about Spinoza throughout his life, Morfino builds a new and comprehensive interpretation of Spinoza's philosophy. In the later sections of the book, this interpretation is used to clarify some of the more problematic aspects of the late Althusser’s philosophy, thereby offering new concepts for a materialist philosophy and the development of Marxist theory." Vorig artikelAlvast genoteerd: volgend jaar "Spinoza and Theology"